Grand Teton National Park may be one of the most beautiful and awe-inspiring parks of the Rocky Mountains. The craggy Teton peaks reach as high as 13,770 feet, forming a bony ridge through Wyoming along the Continental Divide. Fronting the Teton Range lies the twisting and curving Snake River, winding its way down the Jackson Hole Valley. The reflections of the Tetons gently ripple across the river’s serene water. Now in its 5th edition, Day Hikes In Grand Teton National Park includes a thorough selection of 89 day hikes throughout this national park and around the town of Jackson. The hikes include easy-to-follow directions and are well organized by region, making the valley and mountain range easily accessible for everyone. The book offers many options for hiking–from exploring a short distance from the trailhead to climbing thousands of feet in elevation through canyons that lead up to fantastic vantage points. Highlights include lakeshore paths, cascading creeks, rock-walled canyons, panoramic overlooks, waterfalls, hot springs, fishermen trails, prime wildlife habitats, North America’s largest landslide, and two hikes atop the Jackson Hole Ski Resort. The hikes range from well-known destinations (like Jenny Lake and Jackson Lake) to quiet, backcountry trails. The author has written extensively on Montana and Wyoming hiking trails and has personally hiked all of these trails. 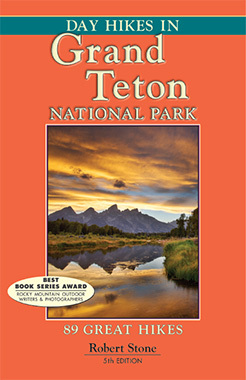 Companion guides include Day Hikes In Yellowstone National Park and Day Hikes In the Beartooth Mountains.